FREETOWN, Sierra Leone — Churches across Sierra Leone held special services Sunday in memory of those killed in mudslides and flooding earlier this week, as hospital officials announced the toll had risen to nearly 500 bodies collected. LOS ANGELES — A soaking storm swept into Southern California, triggering several mudslides, flooding streets and cutting power to tens of thousands Friday after lashing the rest of the state with much-needed rain. TOKYO — Eight people died and at least 13 were missing after rain-sodden hills in the outskirts of Hiroshima gave way early Wednesday in at least five landslides. 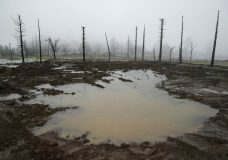 Afghanistan has declared a national state of mourning for the hundreds of people killed by a mudslide.